Cervical ribs are well-described anomalous additional ribs arising from the seventh cervical vertebrae, but they can be a potential cause for wrong-level surgery. 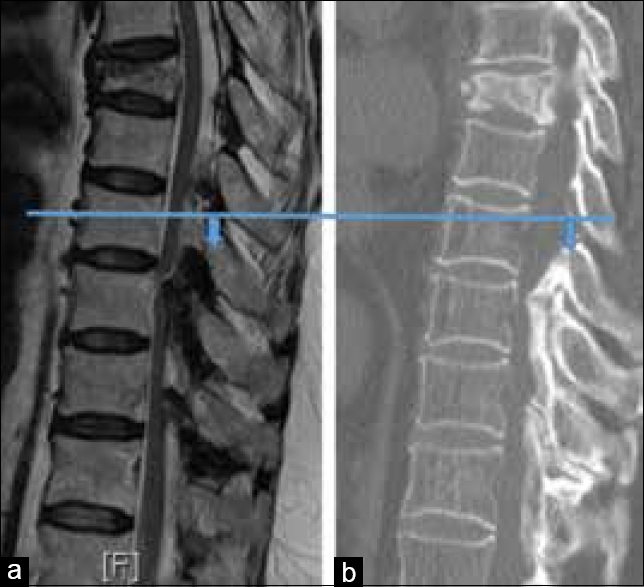 We report a case of a 71-year-old female with bilateral lower limb weakness and numbness due to spinal stenosis from T8 to T11 correlated on magnetic resonance imaging (MRI). However, computed tomography (CT) of thoracic spine showed ossification of the yellow ligament (OYL) one level distal at T9-T12. The whole spine CT revealed the presence of cervical ribs, and the initial discrepancy was caused by counting thoracic spinal levels according to the rib heads. Intraoperative decompression confirmed the dura had merged with OYL at T8–T11. The patient made a partial neurological recovery and could walk independently at 6-month follow-up. This case serves as a reminder for spine surgeons surgical implications of cervical ribs when operating on the thoracic spine, and the authors suggest additional radiological examinations to include the cervical spine to minimize the chances of wrong-level surgery. Spine surgeons frequently encounter vertebral anatomical variation. Common anomalies include sacralization of L5, lumbarization of S1, and eleven pairs of visible ribs.,, Correct interpretations of radiological findings and clinical correlation are of utmost importance in making accurate diagnoses and avoiding wrong-level surgery. Although there is no common consensus on the numeric labeling of spinal levels in the presence of anatomical variation, wrong-level surgery is relatively uncommon under these circumstances.,, Both the sacrum and the axis can serve as fixed anatomical landmarks for reference. Most surgeons plan their surgeries according to the patients' specific anatomy. Thoracic spine is a region where the surgeons may encounter difficulties in localizing the exact vertebral levels intraoperatively. In the operating room, fluoroscopy and plain radiography are the most readily available imaging techniques, but a full length 32” X-ray cassette to include the whole spine from C2 to sacrum is not usually used. Therefore, the first or the last rib is commonly used as reference landmarks. However, anteroposterior fluoroscopy or radiographs carry a risk of image distortion as a result of the divergent X-ray beam to the cassette. Only the vertebra perpendicular to the X-ray tube has a true anteroposterior view. The vertebrae away from this central vertebra have a rotated view, and this may lead to error in counting the correct vertebra. A lateral view is also difficult to interpret since the shoulders often obscure the upper thoracic spine. The X-ray cassette is also not long enough to cover the whole thoracic, lumbar and sacral spine to allow retrograde numeric counting from the sacrum. The diagnosis of most intraspinal pathologies is based on magnetic resonance imaging (MRI) examination, especially for cases without positive radiographic findings on the bony vertebrae. However, intraoperative localization of the spinal level is commonly done with X-ray examination. If there is inaccurate correlation between the preoperative MRI and intraoperative localization with plain radiography due to anatomical variations, wrong-level surgery can occur. The present case is reported to demonstrate such risk in a patient with cervical ribs even without any misinterpretation of the MRI or plain radiographs. Correct numeric labeling of spinal levels from plain radiographs and computed tomography (CT) based on the first pair of visible ribs is not completely foolproof. A 71-years-old lady was admitted to the hospital due to progressive bilateral lower limb numbness and weakness. The sensory level was just above the umbilicus, and her clinical features were compatible with thoracic myelopathy. She was functionally bedbound at presentation. X-ray examination showed osteoporotic collapse of “T7 and L2”. 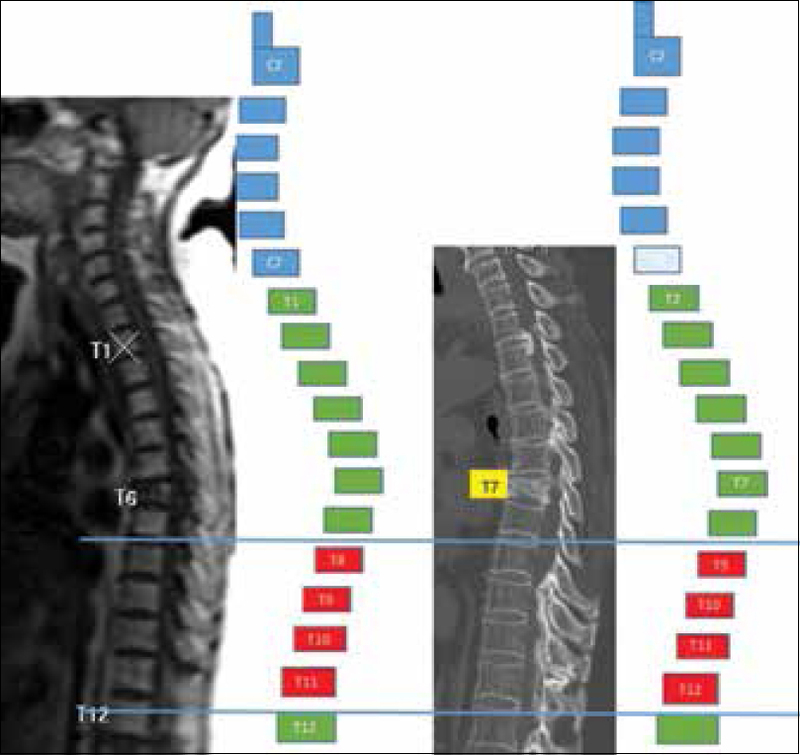 MRI revealed multiple levels of spinal canal stenosis but “T8 to T11” appeared to be the most stenotic segments to account for her clinical features [Figure 1]a. CT scan confirmed ossification of the yellow ligament (OYL) to be the cause of the thoracic myelopathy [Figure 1]b, and the patient was recommended to have posterior spinal decompression and instrumented fusion. During the preoperative planning, discrepancy of the level of spinal canal stenosis between MRI and CT/plain radiographs was noted. The level of stenosis according to MRI was T8 to T11. The radiologist labeled the thoracic segments by tracing from C2 caudally on the MRI scout film. However, CT scan showed that the stenosis was most severe at T9–T12. Compared with the MRI finding, the responsible levels were one level more distal on the CT [Figure 2]. The CT nomenclature of vertebral segments was based on identification of the heads of the first ribs. To find out the reason of such a discrepancy, a CT scan was repeated to include both the cervical and thoracic spine. The numeric label in the whole spine CT scan was also based on C2 and counted caudally. The spinal canal stenosis was confirmed to be T8 to T11 in as was observed in the MRI. 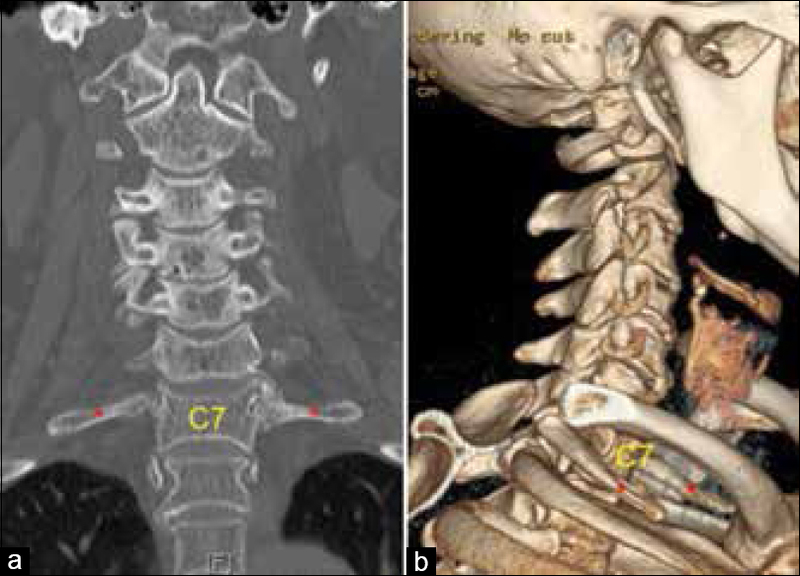 CT 3D reconstruction demonstrated a pair of cervical ribs at C7 [Figure 3]a and b]. The correct level of stenosis was further confirmed by the intraoperative findings. The dorsal side of the dura at T8/T9 was ossified and merged with the OYL. Patch repair of the dura using fascial graft was done to prevent leakage of cerebrospinal fluid. The patient had partial neurologic improvement and could walk independently with a walking frame half a year after the surgery. Wrong-level surgery is devastating to both the patient and surgeon. Realizing the potential pitfalls help to minimize the mishap. MRI is the imaging of choice in demonstrating lesions within the spinal canal. However, it does not show detailed bony anatomy as well as plain radiography or CT. Anatomical anomalies such as cervical ribs may easily be missed on MRI. In the authors' community of practice, spinal level of MRI is routinely counted with reference to C2. The numeric label is based on 7 cervical, 12 thoracic, and 5 lumbar vertebrae. While plain radiographs and CT show bony structures well, it is not always possible to match these findings on MRI. In the current case, CT of thoracic spine was used to confirm the diagnosis of OYL. CT scan of the cervical spine was not initially done, and the thoracic spinal levels were counted according to the presence of first seen rib head, hence labelled as T1. As a result, the C7 was mistaken as T1. 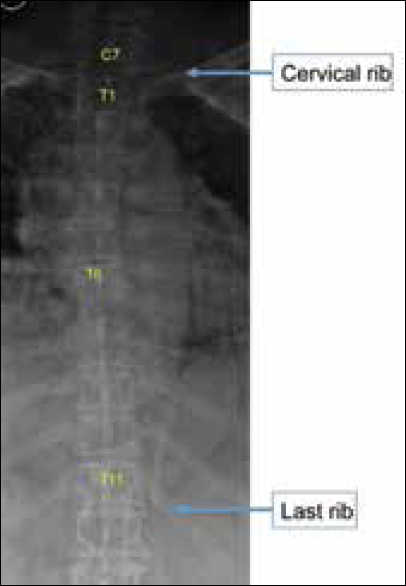 Thoracic radiograph gave an identical finding [Figure 4]. Although the levels of decompression should be T8–T11 based on MRI, the level of decompression would have been T7–T10 if the surgeons had used the first pair of ribs on the intraoperative radiograph to guide the level of decompression [Figure 2]. The same mistake would still occur if the last pair of ribs was used to guide the level of decompression because T11 would be mistaken as T12. Although MRI can demonstrate most thoracic intraspinal pathology, routine standing X-ray examination is recommended even when the pathology is not visible. It benefits the overall patient management in various domains. It documents the spinal alignment and helps the surgeons to determine whether fusion or additional realignment procedures are necessary.,, In nonfusion cases, serial radiographs in subsequent follow-ups help to rule out postlaminectomy kyphosis. Thoracic radiographs can also be used to screen for anatomical variations or bony landmarks. Salient findings include 13 pairs of ribs (our patient has 1 pair of cervical ribs and 11 pairs of thoracic ribs), ossified posterior longitudinal ligament or yellow ligament, osteophytes, and shape of the vertebral body. T7 vertebral collapse in our case could have given the surgeon an unmistakable landmark to guide the level of decompression. The laminectomy should be started one level below the collapsed T7 regardless of what level it was called. The key here is to use all available information to cross-check the level of surgery. The incidence of cervical ribs is reported to be between 0.05 and 3%. Cervical ribs as the cause of wrong level surgery has also been described. suggested strict adherence to the preoperative method of vertebral labeling and working closely with the radiologist to look for unusual anatomy. However, wrong level surgery cannot be avoided in this present case if she did not have T7 collapse as reference to the level of stenosis. Subsequent cervical radiographs and CT scan clarified the reason behind. Otherwise, it was likely that the surgeon would have decompressed T8–T11 as the MRI suggested. The surgical team would have located T8–T11 using intraoperative radiographs or fluoroscopy and identified the level by either counting from the first or last ribs. As a result, T7–T10 laminectomy would have been done. In such a case, the cause for wrong level surgery would be inadequate investigation to rule out anatomical variation rather than misinterpretation of pre- or intra-operative radiological findings. There is insufficient data to support routine cervical radiographs to look for cervical ribs before thoracic spine surgery. However, if surgeons adopt an attitude of zero tolerance to wrong-level surgery,, routine cervical radiographs may be justified if no other specific landmark at the thoracic spine can be used to guide the levels intraoperatively. In addition, the occurrence of 13 pairs of ribs, unusually short first ribs and left or right discrepancy in rib number should alert the surgeons. The patient may truly have 13 pairs of thoracic ribs, but there may be the possibility of 12 thoracic ribs plus cervical ribs. There is no consensus on the numeric nomenclature of vertebrae in the presence of anatomical variations. In the current case, “C7” had rib articulations and did not possess foramen transversarium. Her vertebral arteries entered the cervical spine at C5 and C6 had very small foramina transversarium. Morphologically, C7 looked like T1, and she could be regarded as having six cervical vertebrae. In addition, the convention of numeric labeling of vertebral segments in various investigations differed between radiologists. A potential case of wrong level surgery might have occurred. Ultimately, it was the responsibility of the operating surgeon to define clearly the method of localizing the pathology and reinterpret the various investigations to minimize the chance of wrong-level surgery. Cervical ribs as a cause of wrong-level surgery are not common. If there is no patient-specific radiological feature that can be used to guide the level of surgery, additional radiological examination to include the cervical spine may be a way to minimize the chances of wrong-level surgery. Dzupa V, Slepanek M, Striz M, Krbec M, Chmelova J, Kachlik D, et al. Developmental malformations in the area of the lumbosacral transitional vertebrae and sacrum: Differences in gender and left/right distribution. Surg Radiol Anat 2014;36:689-93. French HD, Somasundaram AJ, Schaefer NR, Laherty RW. Lumbosacral transitional vertebrae and its prevalence in the Australian population. Global Spine J 2014;4:229-32. Hershkovitz R. Prenatal diagnosis of isolated abnormal number of ribs. Ultrasound Obstet Gynecol 2008;32:506-9. Hu Z, Zhang Z, Zhao Z, Zhu Z, Liu Z, Qiu Y, et al. A neglected point in surgical treatment of adolescent idiopathic scoliosis: Variations in the number of vertebrae. Medicine (Baltimore) 2016;95:e4682. Marquez-Lara A, Nandyala SV, Hassanzadeh H, Noureldin M, Sankaranarayanan S, Singh K, et al. Sentinel events in cervical spine surgery. Spine (Phila Pa 1976) 2014;39:715-20. Mayer JE, Dang RP, Duarte Prieto GF, Cho SK, Qureshi SA, Hecht AC, et al. Analysis of the techniques for thoracic- and lumbar-level localization during posterior spine surgery and the occurrence of wrong-level surgery: Results from a national survey. Spine J 2014;14:741-8. Spencer HT, Gold ME, Hresko MT. Abnormal rib count in scoliosis surgery: Impact on the reporting of spinal fusion levels. J Child Orthop 2014;8:497-503. Anaizi AN, Kalhorn C, McCullough M, Voyadzis JM, Sandhu FA. Thoracic spine localization using preoperative placement of fiducial markers and subsequent CT. A technical report. J Neurol Surg A Cent Eur Neurosurg 2015;76:66-71. Kishigami Y, Yoshizaki A, Saito D, Seo H. An evaluation of a new radiographic technique utilizing a concave table. Vet Radiol Ultrasound 2000;41:9-18. Peh WC, Siu TH, Chan JH. Determining the lumbar vertebral segments on magnetic resonance imaging. Spine (Phila Pa 1976) 1999;24:1852-5. Kurosa Y, Yamaura I, Nakai O, Shinomiya K. Selecting a surgical method for thoracic myelopathy caused by ossification of the posterior longitudinal ligament. Spine (Phila Pa 1976) 1996;21:1458-66. Matsuyama Y, Yoshihara H, Tsuji T, Sakai Y, Yukawa Y, Nakamura H, et al. Surgical outcome of ossification of the posterior longitudinal ligament (OPLL) of the thoracic spine: Implication of the type of ossification and surgical options. J Spinal Disord Tech 2005;18:492-7. McClendon J Jr., Sugrue PA, Ganju A, Koski TR, Liu JC. Management of ossification of the posterior longitudinal ligament of the thoracic spine. Neurosurg Focus 2011;30:E16. Aizawa T, Sato T, Ozawa H, Morozumi N, Matsumoto F, Sasaki H, et al. Sagittal alignment changes after thoracic laminectomy in adults. J Neurosurg Spine 2008;8:510-6. Palumbo MA, Bianco AJ, Esmende S, Daniels AH. Wrong-site spine surgery. J Am Acad Orthop Surg 2013;21:312-20.